The year began with Store Championships, where players faced off against local opponents and familiar faces. Then players traveled to Regional Championships, some taking epic road trips with friends along the way. After Regional Championships, the second half of the year heated up as players competed in dozens of National Championships around the world. Now, a quiet period has descended as knights around the realm make their final preparations before heading to Roseville, MN in November for their final chance at glory this year at the 2015 A Game of Thrones: The Card Game Melee World Championship! 2015 A Game of Thrones: The Card Game Melee World Champion? The 2015 World Championships prizes have been determined by the king, but that means only the most courageous knights will be able to claim them. In addition to the participation prizes every attendee of World Championships will receive, players who do well in the 2015 A Game of Thrones: The Card Game Melee World Championship will have a chance at these fantastic prizes. Completion Prize: Each player that plays through all Swiss rounds of the A Game of Thrones: The Card Game Melee World Championship receives two additional copies of the Street of Silk alternate art card. Best of Faction: Each house’s best player receives a wood house card. Top 16: Each player receives a Top 16 World Championship playmat featuring the dragon Rhaegal. 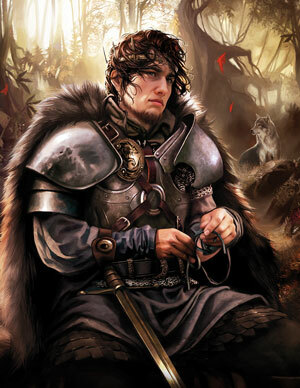 Top 4: Each player receives an art print of Robb Stark signed by the artist, Magali Villeneuve. Winner: The Melee World Champion receives a 2015 World Champion trophy, a unique, one-of-a-kind playmat, and the greatest prize in gaming, the chance to design a card for A Game of Thrones: The Card Game Second Edition! These fantastic prizes aren’t the only things players will leave 2015 World Championships with. They will also be taking away cherished memories of intense matches, new friends, and five days of playing the games they love at the highest level of competition. Keep your eyes on our website for additional information about the event, including live streaming and more! Based on George R.R. Martin's bestselling fantasy epic A Song of Ice and Fire, A Game of Thrones: The Card Game, playable by 2-4 players, brings the beloved heroes, villains, locations, and events of the world of Westeros to life through innovative game mechanics and the highly strategic game play. The Living Card Game format allows players to customize their gaming experience with monthly Chapter Pack expansions to the core game.